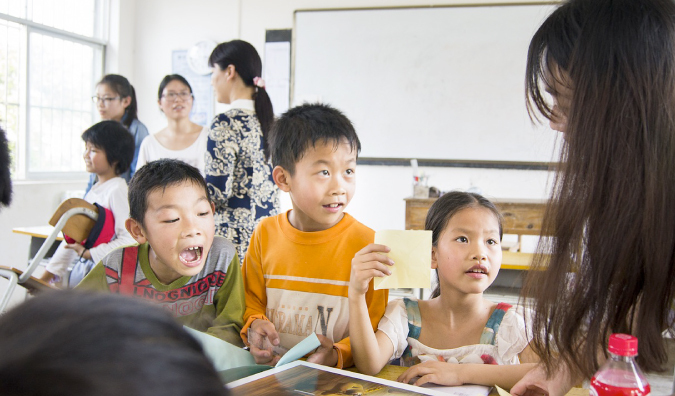 Every year, tens of thousands of people go overseas and teach English. Young and old, they go for many reasons: to learn about a new culture, make some money to travel, seek adventure, or just experience something new. The time I spent teaching English overseas in Asia was life changing. In Thailand and Taiwan, I learned that I could make friends and start a life in a strange place, as well as adapt and thrive in a different culture. It gave me a confidence that nothing else before it had. Teaching English in South Korea — South Korea is one of the best places — if not the best — to teach English overseas. Jobs are abundant, the pay is high ($2,000–5,000 USD per month), and you get awesome benefits, like a contract completion bonus, healthcare, free housing, and airfare reimbursement. A lot of recent college graduates are attracted to Korea because of the money, benefits, and the fact that Korea takes many first-time teachers. If you don’t have any experience, this country is one of the best options for you. As a place to live, Korea has plenty of things going for it: the food is delicious, the country is dirt cheap, and the people are friendly. Plus you will find lots of other international young expats there. Since you earn so much money in a country with such a low cost of living, most people leave having paid off a substantial portion of their debts! You could easily walk away after a year of teaching with your loans (school or non-school) paid off AND money for travel! Teaching English in Japan — Japan’s reputation for good jobs means it also attracts as many people as South Korea. Though the fat years of easily teaching in Japan and making quick cash are long, long over, people willing to stay at least a year can generally save a substantial sum of money. While the cost of living can eat up a lot of your salary, especially in Tokyo, there are a number of programs out there (including the government’s JET program) that reward long-term teachers with generous benefits and completion bonuses. Additionally, the Japanese are incredibly friendly and polite, the food is endless gourmet heaven, and the culture is unique. It’s one of my favorite countries in the world. Teaching English in The Middle East — The Middle East lures many teachers in for one reason: its salary packages. Middle Eastern countries offer incredibly large salaries (up to $80,000 USD per year for an experienced teacher), lots of benefits, and no taxes. A teacher can walk away with around $50,000 USD after one year. However, this is no place for the recent college graduate. These countries want certified and experienced teachers. If you couldn’t teach at a public school in your home country, you have little chance of getting a job in this part of the world. As such, most of the teachers here are older and more settled and have families. Dubai, Qatar, and Abu Dhabi are the most popular destinations for teaching English. Teaching English in Thailand — Thailand attracts lots of young and new teachers with its cheap cost of living, warm beautiful weather, tropical beaches, mouth-watering food, and party atmosphere. Most of the language school teachers are ex-travelers looking to save for future travels…or travelers who thought they were doing that but ended up never leaving. The pay in Thailand isn’t that high ($1,000–2,000 USD per month), unless you teach in Bangkok or at an international school. However, teaching English in Thailand isn’t about making lots of money — it’s about everything else: the ease of getting a job, the food, the fun-loving atmosphere, the weather, and everything in between. It’s one of the best destinations for young, new teachers, especially in a larger city, since you’ll fit right in. Teaching English in China — As China rises in global stature, its need for English teacher grows as more and more citizens need to know the language for their job. Moreover, the culture puts an emphasis on learning it. As such, it is one of the easiest places to find work. No matter where you go, you can find work, even in saturated cities like Beijing and Shanghai. You can earn loads of money teaching English there (upward of $3,000 USD a month), and many jobs give completion bonuses, free housing, free lunch, and airfare reimbursement. China is the brave new world and a country in constant change. It’s a good location for teachers of all abilities — there’s something for everyone there! Teaching English in Prague — Prague has a seemingly abundant supply of teaching jobs. The city has grown in size the last few years, attracting a variety of tech start-ups and expats, which has created a lot more job opportunities for teachers. While it’s very hard to get a job in the public school system or a university, there are plenty of language schools in the city to choice from. The pay isn’t as high as other countries in the world and there are few benefits (especially when compared to Asia or the Middle East), but you’re a stone’s throw away from everywhere in Europe (making Prague an excellent central base from which to explore the continent), and the city is one of the most beautiful, vibrant, fun, and growing cities in Europe. Teaching English in Spain — In the last few years (and despite the economic downturn), Spain has become one of the premier places to teach English overseas. There are plenty of jobs, the government has an active program for attracting teachers, and your visa means you can freely travel around Europe. There are also many opportunities to teach private lessons on the side. You don’t get many benefits (or high pay compared to Asia or the Middle East), but the pay is still enough to live off of. Teaching English in Taiwan —Taiwan is an excellent country to teach English in, thanks to lots of job opportunities (though they tend to be with young kids), high salaries, benefits similar to South Korea, and lots of other young teachers to share a social life with. The country places a very high importance on learning English, and you’ll be able to find freelance tutor opportunities besides your regular, steady teaching job! I loved my time in Taiwan, made some wonderful friends, and adapted to a culture that isn’t as Western influenced. Anywhere with Craigslist — Don’t want a formal job, or not planning on staying too long in one place? Post ads on Craigslist letting people know you are available to be a private tutor and/or for conversation exchange. Most people just want a language partner to be able to learn how to speak the language instead of just learning from books or online courses — they care less about grammar rules and more about knowing what to say when. So post an ad, head out for coffee with your new acquaintance, and make some money for drinks as you travel the world! I had fun teaching English overseas. It was on my favorite experiences on the road and it taught me so much about myself. You gain a lot of perspective on life by living in another culture. While there is an opportunity to teach wherever English isn’t the native language, the destinations above draw the biggest crowds, offer pay the best, the best perks, and are the most fun. If you are thinking about becoming an English teacher overseas, my advice is to head to one of these destinations and just do it! This digital guide will put you ahead of your competition, help you land a high-paying job with a reputable company, and give you first-hand knowledge from real teachers! Get started today with this downloadable PDF (for your computer, e-reader, or mobile device) with the book PLUS 12 interviews about life as a teacher, plus job advice from one of the industry’s top recruiters! Note: I wrote earlier that you could earn upwards for $4,000 a month in China. That was meant to say $3,000. Do these places hire older people? Once I retire, I would love to teach English overseas. If you’ve over 30 you’re going to have a harder time finding a job in South Korea. Jobs have dried up there in the last two years and they have a real preference for young teachers (they value youth over experience). In China, you’ll have jobs thrown at you left, right, and centre. If you have subject experience (not just ESL) you can make good money in the public school system. For older people, jobs are harder to get but not impossible. I taught with many retirees in Thailand. Hi there, I am very new to this industry. My name is Matthew btw 🙂 Would any of you be willing to chat with me about beginning steps? You could volunteer to teach in Southeast Asia, but for paying positions, unless you have an advanced degree like a master’s in ESL, it’ll be VERY tough in retirement age. I volunteered with a number of retirees through a program called Angloville. They offer programs in Hungary, Poland and Romania. If you’re looking into South Korea, yes. If you’re young and white you’ll have a better chance at finding a job. Most places will require a degree and will only want native English speakers (US and Canada preferred). That doesn’t mean you shouldn’t look though because if you can land a job, it’s a good place to be. Jobs aren’t as plentiful as they were a few years ago. Would it be possible for me to teach English as an 18-year-old high school grad? What countries don’t require a college degree and should I get an ESL certificate? any advice for me? 2. In Asia it can be difficult to teach English if you don’t look ‘American’. I AM American but look Chinese, and in China I had struggles with Chinese parents and school principals to allow me to have jobs. I’ve heard in Korea I wouldn’t be accepted at all. Oh wow, that’s horrible! Didn’t know they were so strict on the “American” look! I’m Canadian but of Chinese descent and I didn’t have that problem when I was teaching English in Germany! Asian Americans do have it tougher when applying for jobs in Korea, but I’ve seen many who do, and not just Korean Americans but Vietnamese Americans and Chinese Americans. It all depends on your approach and the like. I’ve taught in Korea for a few years. You can land a job even if you aren’t white. While it may be true that jobs aren’t as available as a few years ago there are still plenty. Best way to get offers is still esl cafe. Post a quick “resume” (a paragraph about yourself) and you’re inbox will be filled with recruiters sending you job offers. Hey Matt.. what about the Philippines and Singapore and Indonesia? English is a native language in Singapore, so they wouldn’t really be looking for ESL teachers, as they have Singaporeans who can teach it. If you want to teach there it’d probably be at an International School (and thus you’d need some experience first). While not technically ESL, it is possible to teach English in Singapore without a teaching qualification. I taught there for 2 years (reading, creative writing, phonics etc) and it’s probably the best place in Asia to save money if you’re not a qualified teacher. What Edna said! Same with the Philippines! Please inform me where you can make 4000 USD a month in China. I have been living here three years and haven’t found that yet and would love to!!!! That would be amazing! Yeah, that has to be a typo. My English teacher roommates in Shanghai were pulling in 2500, 3000 USD/month at the most (and that’s after years of experience)! The only teachers I knew making $4000+ were at the expensive international schools (Dulwich and the like), and had been teaching at least 5 years. Yeah that was a typo. It was supposed to say $3,000, though $4,000 is possible in the cases you gave. Also $3,000 dollars is a bit high for South Korea. It should read $2,000 and up (which you will earn at universities). I’ve heard you can make that if you hustle constantly and do tons of private lessons outside of work. Is that true what some people are saying here that you can’t get into Korea if you’re over 30? The reason I ask is I will be 29 when I graduate from school with a bachelors (yes, I started college late in life) and I was thinking of maybe doing some teaching in Korea when I finished. I’m a white American and look fairly young now but family history says men start balding in there early 30’s so I might not look as young 3 years from now. Does anybody with experience in Korea see people who are in there early 30’s teaching English? I can’t attest to age but I had a British friend who was 23 and had already gone bald, and was always mistaken to be in his 30s, and he had no problem getting a job in Seoul; ended up staying there for three years. There are native teachers in Korea in their early 20’s right up to almost 70 years of age. These days it is harder to find a job if you are over 30, but once you’re here and has a good record, you will be able to stay for a very long time, or as long as you wish. They rarely renew a contract more than twice, but nothing stops you from contacting recruiters for your next job here. There are many FB pages dedicated to jobs in South Korea. Good post, but I would not classify South Korea as “dirt cheap”. I think that’s an exaggeration. The country is a great value if you’re earning a teachers salary or traveling with dollars, which means you get high quality transport, food, service for not too much money. South Korea can be inexpensive, but Cambodia, Indonesia, and Bolivia are dirt cheap. I actually would agree with Stephen on this. I liked your post but Korea isn’t what it used to be for teachers. It’s still a cheap place to visit but living here is a whole other thing. The expenses of groceries, bills, and transport have all risen significantly in the last few years. So many people come here thinking they can pay off everything in just one year and save bags of money but it seems to happen less and less now. I don’t know a single person who managed that all in one year. The salary for school teachers usually starts around $2000 rI live as south of the country as you can get and will just about manage to do it in 2 years with being super careful and living half the time like a hermit; Seoul is now one of the most expensive cities in the world and quite a lot of teachers who live around those areas have noticed that it takes a longer time to sort out their finances now. ESL Salaries are not 3000-4000. University jobs aren’t even that anymore. standard is 2,000,000 won – 2,500,000 won, which is roughly 2000$ per month USD. People making more are teaching privates on the side which is illegal…and yes they occasionally do find people doing it and send them home or fine then big. Also, prices are roughly the same as city prices in the states. Korean food being cheaper (4-12 $ per meal) and western being more expensive. cheapest beer you’ll find in a bar is about $3.50 and about 2$ from a convenience store. I second what another commenter said — the norm for English teachers in China is definitely not upwards of $4000/month! Most of my roommates were established, professional English teachers and still on a budget after paying the month’s rent, most were making around $2500/month. I was working for a well-known American car brand in Shanghai (meaning: huge budgets) and even then most of the people on my team (experienced Americans, Brits, Canadians etc.) weren’t paid that much. That’s 25,000 RMB/month; that’s mid-level salary, not entry-level; and if you can swing that in any job in China in your early 20s you are doing pretty well. I just landed in Suzhou, China a week ago and started teaching at a private school – so far it’s going very well! The workload is very reasonable compared to teaching back home in Canada, and I get plenty of time to plan and mark during working hours. My adventure here has only just begun. To be honest, I was very overwhelmed my first few days, but it gets better each day. The food here is unbelievable and the lifestyle really grows on you. Good luck! You will be happy if you keep a smile on your face at all times! I used to teach in Japan, and it was a very rewarding and interesting experience. I would highly recommend it! Does anyone know about teacher requirements? I’m from the US and I don’t want to finish school. Generally speaking, do you have to have a degree to get these jobs? Can I still find jobs without any experience or a degree? You can find some job in places like China without a degree. It happens a lot, but this would be “illegal” jobs in private schools. The reason is that you officially cannot get a teacher visa if you don’t have a degree. Will any degree suffice or do you usually have to have a teaching degree? I have an associates degree in liberal arts. Is that enough or do I need to have a bachelor’s? You need a four-year degree, but if you’re willing to risk working under the table, China is a huge country with huge demand for ESL. So do you have to be ESL certified to teach overseas? Are there opportunities where just a bachelors degree will suffice? I’ve been in the corporate world since I’ve graduated college, but would like to teach in Asia as a change. Depends. Some countries require it for visa purposes. I would say if you have just a bachelor’s degree, you’ll good about 60% of the time. Having both, you are good 100% of the time. It is an awesome country for sure! I was teaching English in Cambodia for 6 months and I loved it. I’m not an English native speaker and I don’t have a certificate. You can come a long way with ambitions and a will to learn. Dear matias, possible to share on how you found a teaching job there? I am planning to teach there but I have no idea how to. I am a Singaporean and I do not have a teaching certificate. I have to disagree with a lot of the South Korea section. Jobs are getting much more scarce and salaries aren’t keeping up with inflation. Korea is hardly ‘dirt cheap’. And most people are making only around $2,000 us per month. University instructors might make $3-5000 but not regular public and private school teachers. It’s still possible to pay off debts there though. I have been wanting to teach overseas for probably 15 years and just never made the opportunity. I really feel that the opportunity is here for me within the next year. I just had a few concerns. I am African-American and I know that Caucasians are looked upon more favorably from most of the Asian countries than I would be and I am a bigger guy and I am 38. Do you know of African-Americans who have taught overseas and what has their experiences been like and how likely would it be that someone would hire me. Hey Stefan! I’m an African American male who has been teaching in South Korea for the past 4 years. You are correct; most places will look favorably upon the “American” look (blonde hair, blue eyes). But my advice is to not let that deter you. There are places looking to give their students exposure to people of ALL backgrounds. My place of employment was very open to hiring me; they looked at my credentials rather than my appearance. If teaching in Asia is something you want to do, I would say go for it! It can be done. Good luck on your journey! Stay positive! Stefan, try China or Vietnam, the demand in those two countries are high at the moment. I recommend Vietnam since the cost of living is so low there. I’m a teacher by profession and actually was offered a “real” teaching job in Switzerland just before my husband got offered a better job in Germany. After traveling to Thailand several times, we’d love to eventually head back there for a longer period of time and know that teaching could be just the perfect way in, so I’m glad to see it made the list! Do you know of any specific organizations? Check out Ajarn.com for the latest jobs and info! Wow, this article is not accurate at all. Salaries are way off. Even a quick google search will tell you this. While I’ve seen a lot of cool articles over the years from NomadicMatt – this is just poor form spreading this misinformation. I’m currently placing people in jobs in Korea, Thailand, Vietnam and China. The fact that Vietnam doesn’t even make the list and that it’s the best place to teach English in the world now with high salaries and dirt cheap living expenses shows how off this article is. A quick Google search will tell you I’m right as well a trip to Dave’s ESL Cafe. Salaries here are ranges and I use the word “upwards” for a reason – they can go as high as that but are not the norm. Dave’s ESL Cafe isn’t the best source for information on teaching English in Korea. The market for ESL in Korea has been declining and such, and while demand won’t disappear, it’s NOT the best place to teach English. And yes, I have to agree that your omission of Vietnam was glaring, as you can live on as little as 300 bucks a month there. I visited Vietnam twice and saw the growing market firsthand. You can live in a lot of countries for 300 bucks a month…doesn’t make them great place to get well paying jobs though! I am inquiring as to skills beyond basic English. ?i am middle age but well educated in team building skills as well as employee engagement and mediation. Are there opportunities for skills beyond the basics in English? I do have a masters in organizational communication. Theses skills are applicable to any age or group. Alex,interesting read re Vietnam and the salaries…Do you have to have a degree to teach in Vietnam ? Do you know of any good contacts there too teach? I taught in Spain for 3 years, and one of the perks with the government program is that you only work 4 days a week, so every weekend is a 3day weekend. This frees up days for traveling, or finding private classes to supplement your income. I’ve done some research on teaching English abroad and some of the websites that pop up seem a bit sketchy. Do you have a few websites that are reputable? How can one tell if a teaching abroad organization is creep or keep? Hi everyone ! I am from India & it’s truly great that so many countries all over the world have conquered the desire to learn English. I would love to pursue my passion for teaching English in places like Spain, Japan & Prague. Hey there NomadicMatt. The article is very informative, and recent. 🙂 I am planning to teach English abroad, but I am so intimated with everything that I am reading online. I dont have a degree, and not a native english speaker (ESL wise), although i grew up speaking english at home because my dad is Filipino – American. The only thing that I have on my sleeve is years and years of corporate training. I am still planning to get my TEFL certification, but i am honestly scared as I really dont know where or how to start. Help! Do you know of other filipino teachers who were able to land on real teaching jobs, even if they dont have a degree? You could go to Vietnam or China as many there don’t teach with a degree, but well, most of the world wants a degree and such. Having no degree or visa to teach could also leave you vulnerable. Nice list. I taught English in Spain and I think it gets overlooked quite a lot. There are a surprising number of jobs & pay is high relative to cost of living, especially in the south. Yeah, what’s up with Vietnam not making it on the list? Hi, thanks for the very informative article! I am currently a freshman in college and very interested in teaching English abroad after getting my Bachelor’s. I just have a questions about qualification: will having a bachelor’s degree plus a state (Ohio) license in TESOL be sufficient for countries that request teachers with “TEFL certification”, or I would I be required to get the certificate from an online course or something? Thanks Matt! 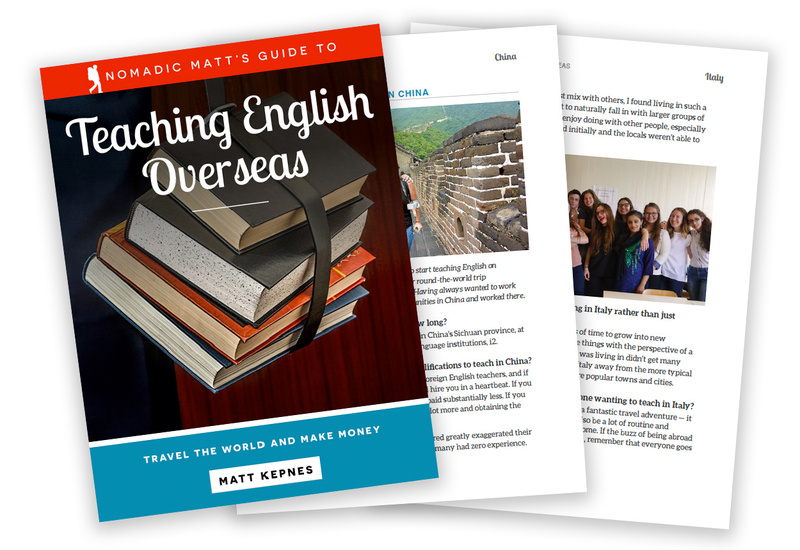 I am thinking of teaching English overseas after I graduate and this was tremendous help! Since traveling and learning about different cultures is a passion of mine I think it would be awesome to help others learn about my culture and language as well. I am trying to find out, as a non-EU resident if it’s impossible to teach ESL in Spain. I am getting mixed messages about this from my internet research. Can you tell me if I should just give up on this idea of working and living in Spain, or if there is a way for a Canadian to find some teaching jobs there. Thanks! There are plenty of companies that will sponsor a work visa. Thank you everyone for the information. I have some questions please, what are some websites of schools I can look at to apply. Has anyone come across a teacher with a family? Can you give details on how that worked. What is the average start up cost? Do most school provide a place to reside, at least temporarily? What is the teaching structure, are you given free range, or is it cut and dry? Awesome article. Yes, some details about salaries are a bit off but very useful info. I got two questions and if anyone can answer, greatly appreciated. I’ve taught in Taiwan for a year several years ago. I’m in my late thirties now and heard that the ESL market had dried out there and that jobs are scarce, especially if you’re older. Is that true? Also, does anyone by any chance knows if there are places where I can teach (part time) while also getting an MA in English or TESOL? I have some MATESOL coursework but no degree. Alternatively, is an online MATESOL waste of money? Not sure if anyone knows, but any insights would be appreciated. Interesting but as other have pointed out, your information on Korea is way off. No new fresh off the boat teachers will be pulling in $3000 even if you included the housing and flights. Even experienced and certified teachers on a simple conversation visa are highly unlikely to get $5000. As for Korea being cheap? Were you in South Korea? Jokes aside SK is hardly cheap, housing, meat, imported booze and perishables are all pricey. Transportation is reasonable. As other have mention jobs here are no longer plentiful and the market has significantly contracted with salaries stagnant. 2,1million entry level wages are the same as they were 10 years ago. Inflation hasn’t however stood still. Kimbap cost 600won a roll in 2006 it costs 2000 at the same place today. I didn’t say fresh off the boat teachers! I said teachers can UP TO that number. There’s always a salary range. And those dollar Soju’s I had in Seoul and $8 BBQ meals were certainly cheap. Obviously inflation occurs over a ten year period but I wouldn’t know prices from 2006 since I first went in 2012 and inflation hasn’t changed that much since then. SK is a cheap country even by 2015 standards. If you want a bunch of imported goods, that will be expensive but that is true for any country. What a great idea. Teaching English gives you the opportunity to spend plenty of time in another country to get to know their culture while financing your stay. I have a college degree but not in Education. I do not know if this is enough. I will have to get more info on this. Just to let your readers know, it’s illegal to teach/tutor without a work visa in Korea. You will be deported, and you could be banned from entering the country for many years. As far as older teachers go, it’s not impossible to be hired. I know teachers in their 60s teaching here. At 60, I landed a job this year with one of the top universities in the country. I have 15 years experience, and some employers do value that experience. I am going to complete my masters in English language next year. I am planning to teach English in either South Korea or Vietnam. I am of Indian origin. This article was of great help. However I want to know if Indians can find teaching jobs in these countries? Has anyone heard good/bad things about EPIK program through the Korean government? Looking into applying through them to teach English next August but would prefer some advice from people familiar with the program! Thanks! I currently teach in the EPIK program. It really is a fantastic program and I personally recommend it over teaching in a private hagwon. You’ll need to get a TEFL certificate to apply if you don’t already. I have a degree in English and History but no teaching certificate. Can I still find a good position in the Middle East with my degree and ESL certification? Without any experience, I would say it is doubtful. Thailand: For a full-time position you’ll make a basic salary of approx 30,000 Baht (800-900 USD) in the provinces. Out of your salary you’ll have to pay for rent (house is about 5,000 + house bills/ food/entertainment 15000). You’ll be lucky to save 10,000 (300 USD per month). And that may have to go towards return travel as schools don’t always pay that. Think also of additional expenditures like furniture as many places you rent come unfurnished. It’s become a very popular destination for new graduates who’s naivety is a good source of exploitation. Be warned, don’t come here with the “everyone is beautiful” attitude, you’ll become bitter very quickly. As for Bangkok, if you can handle it…do it. Sorry to be a harbinger of not-so ‘Amazing’ news, anyway you have to try it for yourself. I am a 24 year old black woman. I want to know where I can go and won’t feel not welcome/ in danger due to my race and gender. I’ve had places in mind, but every time I read about them, I am warned harshly. Any ideas? Kim, there are SO many places in the world where you can go as a black woman and feel safe! I’ve traveled throughout Europe and have, at many times, felt safer there than in the U.S. (in terms of walking home at night alone, etc). There are a lot of female black bloggers out there who have traveled to tons of countries. Some off the top of my head include Oneika the Traveller (who did an interview on this very blog about this: https://www.nomadicmatt.com/travel-blogs/oneika-success-story/) and Gloria from The Blog Abroad. Google their blogs and see their experiences — they talk a lot about what it means to be a black woman and travel, too! Hey Matt. For so many TESL programs in College, it requires me to have an at least 3 year Degree prior to taking the program. I can’t go in to a bachelor degree since I was never able to take University courses in High School. Do you know of anything I could do instead so that I have the proper requirements to teach English abroad. It had always been my dream and first on my list is definitely South Korea. Thanks! I’m glad that China is on this list! I’m one-quarter Chinese so I’ve always wanted to spend some time over there – and what better way than by teaching English? It’s good to know that they take teachers of all abilities. I just graduated in Elementary Education but haven’t taught professionally yet (I’d like to teach overseas before I settle down in the states and do that). Thanks for talking about this, Matt! If someone has an MA in TESOL and 3 years of working experience, would they be able to get a job in the Middle East, or does one actually have to be a licensed teacher to land a job over there? Matt: I have taught in Taichung and Michoacan. I am looking for somewhere south to teach again. I am 49, female, and speak rudimentary Spanish. Your best suggestions please? I want to flee Charleston as everyone is flocking here and cannot afford a living. I have a 10 year old son so I may have to leave him for a while with his dad to make some money but seeking long-term lifestyle southward. Thanks! Is it really true? OMG! Then help me because I am a Nursery/Crèche Teacher seeking for employment in China. Thank you for sharing. I’m a veteran elementary school teacher and am burning out in our public school system here in Texas. I am looking to go overseas to see if I could follow my passion (teaching!) and get well compensated for it….or at least have the adventure of a lifetime.? Anyone know if it’ll be hard for a couple to get jobs teaching English if they have different accents? I’m American (can easily speak non regional diction) and my boyfriend is British (classic London). We are hoping to get jobs in Korea, but I’ve heard they prefer American. I am an ESL teacher in Canada. I have 2 degrees: Bachelor’s degree and a Masters-TESL and Celta. I would like to work teaching adults in the Middle East. I would like to work for a year and have lodging provided . Any helpful advice or suggestions. ?